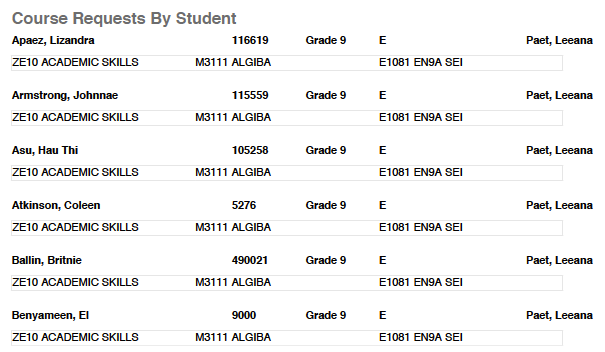 This is an overview of the different course request reports available in Illuminate. Reports are permissions controlled, so in order to access them you must have permissions enabled. Downloadable report (PDF or Excel) listing all course requests grouped by student. This report can be filtered by grade level, house and counselor. Lists counts of course requests for each student and the equivalent "block count". A course request for a 1 term course counts as 1 block, a course request for a 2 term course counts as 2 blocks, etc. This report can be filtered by grade level, house, counselor and number of course request per student. Run this report after course requests have been entered and prior to running the course tally. Use this report to identify if students have too few or too many course requests. Do not run the master scheduler until these potential conflicts have been resolved. 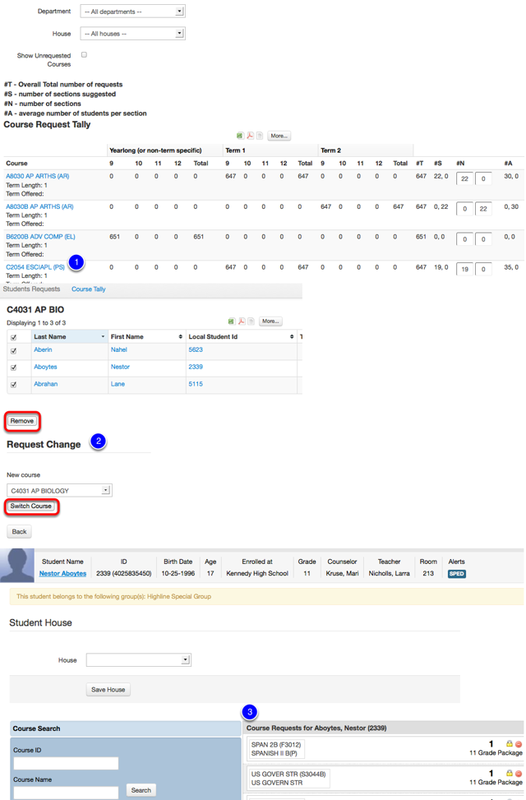 A table of all courses categorized by requests by grade level and term including the overall number of requests, number of suggested sections, actual number of sections to create, and average number of students per section. Drill into the blue course links to see the students with the course requests for that particular course. Remove or switch the course request. If the student course request is not switched or removed in step 2 above you can drill down to the student level and change the course requests for individual students. 2. ...as well as how many students of the students who requested the given course also requested the other courses. You may click any of these numbers to "drill down" to the list of students who requested both courses (the Conflicting Requests Report, also covered below). For example, in the report shown above I can see that 607 students requested Algebra, and all 607 of those students also requested Academic Skills. Because these two numbers are so close or in this case the exact same, it is best for Algebra and Academic to be offered during different and/or multiple periods so that those students may take both courses. The higher the number of common requests between two courses, the more important it is that the two courses be offered during different periods of the day to avoid scheduling conflicts. The fewer sections there are of a given course, the more likely it is that it will create scheduling conflicts, as well. This report can help you to locate the courses that are at highest risk for creating conflicts.